The Event Horizon Telescope (EHT) is a planet-scale array of ground-based radio telescopes linked together to capture the first image of a black hole. An announcement on April 10th, 2019 reported that this monumental goal was accomplished, based on observations taken in April 2017 of the galaxy M87. 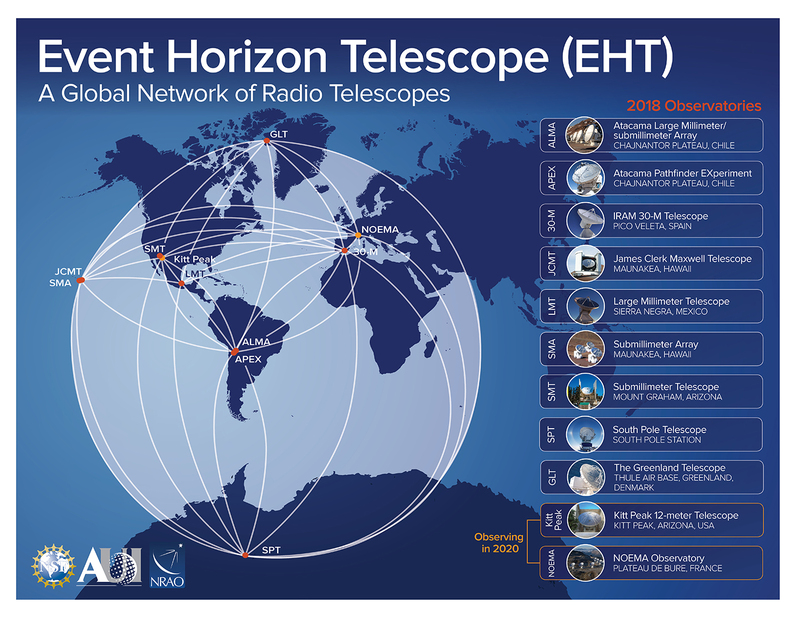 The EHT observations use a technique called very-long-baseline interferometry (VLBI), which synchronises telescope facilities around the world and exploits the rotation of our planet to form one huge, Earth-size telescope observing at a wavelength of 1.3mm. VLBI allows the EHT to achieve an angular resolution of 20 micro-arcseconds — enough to read a newspaper in New York from a café in Paris. The 2017 observing run required upgrading and connecting a worldwide network of eight pre-existing telescopes deployed at a variety of challenging high-altitude sites. One of the telescopes in the EHT is the Submillimeter Array (SMA), which is a joint project between the Smithsonian Institution and the Academia Sinica Institute of Astronomy and Astrophysics (ASIAA) in Taiwan. 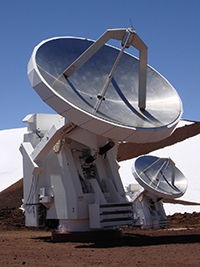 The SMA is the world’s first imaging interferometric telescope for submillimeter observations. It is located at 4070 m (13,350 ft) above sea level near the summit of Maunakea in Hawai'i. Because water vapor in the Earth’s atmosphere absorbs submillimeter radiation, observations are only possible at exceptionally dry locations. On Maunakea, one of the best observing sites in the world, the SMA is above 90% of the water vapor, allowing pristine data to be obtained. The array consists of eight antennas, each with a smooth parabolic reflector 6 meters (20 ft) in diameter. To make a picture of the black hole in M87, the EHT needed to detect tiny details in images. This ability improves when the separation between telescopes, termed the baseline, is larger. 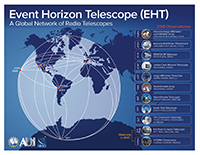 Because the longest baseline for M87 stretches from Hawai'i to Spain, the SMA was a crucial part of the successful EHT campaign in 2017. The other telescopes contributing to this result were ALMA, APEX, the IRAM 30-meter telescope, the James Clerk Maxwell Telescope, the Large Millimeter Telescope Alfonso Serrano, the Submillimeter Telescope, and the South Pole Telescope. Petabytes of raw data from the telescopes were combined by highly specialised supercomputers hosted by the Max Planck Institute for Radio Astronomy and MIT Haystack Observatory.